“Neo-liberalism” has become an excuse by many who self-identify as left-wing to avoid confronting the reality of capitalism as the source of economic stagnation. It’s as though a return to Keynesianism is some kind of answer. There’s nothing new in this situation, as leftists influenced by Marxism have always rejected social democratic (in the sense of labour parties) efforts to keep the zombie system alive. The following article is a good one for making this point but also for discussion and debate. The following article by Michael Rectenwald is published with permission of With Sober Senses, the on-line publication of Marxist Humanist Initiative. There’s a basic article of faith in leftist thought, held especially dearly by most among the U.S. left. It is so entrenched and so seldom challenged that it has attained the status of myth, an unquestioned origin story on par with the Book of Genesis, as the latter must have been regarded within Christendom during the Middle Ages. The myth goes like this: During the 1980s, Ronald Reagan and Margaret Thatcher, two arch right-wing and highly potent politicians, rose to power in their respective nations, the U.S. and the U.K. They thereafter began to institute what was for the vast majority a vile and destructive political and economic scheme: “neoliberalism.” Previous to the instalment of this neoliberal scheme, the working class had experienced relative economic improvement, and capitalists seemed happy too (as if we care). But suddenly, and seemingly without cause (although the failure of Keynesianism was apparent in the unprecedented stagflation of the 1970s), these evil political twins, prompted by wizards who formalized the approach, introduced the nefarious ideology of neoliberalism to the world. As cruel and heartless representatives of the capitalist class (which, indeed, they were), they and their supporters caused the Fall from the supposed Paradise of Keynesian reformism that had preceded them. In this mythological version of reality, neoliberalism is understood merely as a set of essentially unwarranted and unusually brutal policies, an ideological and political formation that was hatched in the brains of evil masterminds conspiring in right-wing think tanks, concocted to dupe and punish the vast majority for the benefit of the rich and powerful. The mythological version of neoliberalism is invoked daily, and most recently in response to such events and political developments as Brexit, Trumpism, and the unprecedented political (albeit thwarted) success of the “socialist” Bernie Sanders. According to journalist Glenn Greenwald, the “leave” outcome of the Brexit referendum registers what should be an expected response to decades of neoliberal policies foisted on the masses by the EU and the British political elite. Along the same lines, Michael Hudson argues, “the whole withdrawal from Europe means withdrawing from austerity… The rejection of eurozone austerity is, essentially, a rejection of the neoliberal plan that the TTIP is supposed to be the capstone of.” Similarly, in the U.S., the appeal of Donald Trump is due at least partially to his feigned and misleading championing of U.S. working-class interests, a working class which, Trump suggests, has been made redundant by lopsided and globalist trade deals and outsourcing/off-shoring, and reduced to the precarity of part-time and/or Uberized piece-meal work or permanent unemployment. As Trump, Sanders, and the left blogosphere see it, these dire consequences are all due to the choices of neoliberal politicos, especially Reagan, the Bushes, and Bill and Hillary Clinton. Indeed, Bernie Sanders’s entire presidential campaign can be summed up simply as: “just say no to neoliberalism.” The “political revolution” that he heralds effectively amounts to a reversal of neoliberal policies and their replacement by progressive ones. According to Sanders, the entire economic fiasco that we have been enduring has been the result of a series of political and policy decisions that have been disastrous for working Americans. What’s the problem with this narrative, you ask? After all, didn’t Reagan actually begin the defeat of unionism with the breaking of the Professional Air Traffic Controllers Organization’s strike on August 5, 1981, thereby effectively inaugurating the long period of neoliberalism that we have been enduring ever since? Didn’t Bill Clinton, the arch neoliberal Democrat, sign NAFTA into law in 1993, a trade agreement that eviscerated labor and environmental protections, while costing millions their jobs? Didn’t Clinton also repeal the Glass–Steagall Act in 1999, thereby supposedly eventuating the massive financial crisis of 2008, the effects of which we are still reeling from to this day? In short, didn’t political agents actually institute neoliberal policies, policies that continue to disenfranchise and oppress us? And shouldn’t we elect as President someone like Bernie Sanders, Jill Stein, or another leftist, who would reverse these policies? Finally (this part of the story is optional in some circles), hasn’t the capitalist class made a killing over the past forty-plus years, while they simply ignored (or some may say, enjoyed) the stagnant wages of the vast majority, the widening gap in income, and the rising tide of poverty? Isn’t there a huge and growing pie from which the majority simply have been excluded to a greater and greater extent? In the short term, don’t we simply need to get a bigger slice and then (perhaps) talk about the whole pie later on? The problem with this story is that while grossly exaggerating the impact of policies and trade agreements, it excludes a key underlying and primary causative factor of the current instability and malaise. This key factor is necessary not only for diagnosing but also for addressing the conditions that we face today. Keynesian reformers and social democrats, including Bernie Sanders, are either utterly unaware of, attempt to blithely ignore, or otherwise contest this factor. But its existence and effects are undeniable and its implications are enormous. That is, excluded from the standard leftist narrative of neoliberalism is the following: the underlying, decrepit state of capitalism over the past forty-plus years, and the unlikely prospects for a return to robust economic growth in the foreseeable future. Few thinkers, even among Marxists, seem willing to tell the working class this fundamental fact, and it surely is not going to be acknowledged by major political office holders or campaigners, whose careers depend upon the belief that their particular nostrums or plans will remedy the crisis. Yet neither Trump with his protectionism nor Sanders with his so-called socialism can restore the economy (in the U.S. or beyond) to post-war levels of growth, the kind of growth upon which their promises depend. Likewise, their policies and plans would not ameliorate the conditions of the vast majority. As long as the economic system is capitalism, profit will be the driving factor, and the predicament of capitalism has precisely to do with a loss of confidence in the profitability of investment. In 1973, an already sluggish world economy bore the immediate effects of the oil-price hike. Although the rate of profit temporarily rose as a result of the inflation brought about by the rise in the price of oil, it resumed its longer-term downward trend after a few years. That trend has continued, with spikes and dips in the interim, to this day. Marx’s law of the tendency of the rate of profit to fall had always been in effect since the inception of industrial capitalism, but since this point in history, insufficient countervailing factors have been available to offset the tendency. Because profit is the driving force of capitalist production, the only incentive for undertaking it and the only long-term source of funds for productive investment, we face unstable and grim economic conditions and prospects. 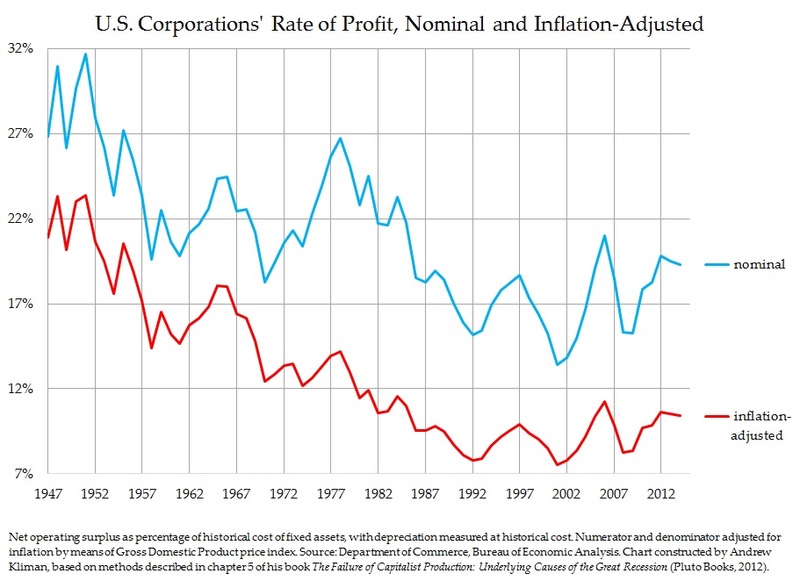 Given the low yields in profit, an effective productive investment boycott has ensued, and since the mid-70s, the worldwide rate of growth has been approximately halved. While there have been relative booms and busts in the interim, these have been due largely to short-term, financially-driven bubbles, and perhaps the introduction of new markets and newly super-exploited labor forces. Nevertheless, the economy has never returned to post-war boom levels. Ignoring or blithely unaware of this economic reality, leftists mistakenly imagine that “neoliberalism” has merely been the desideratum of wicked politicians, who under the influence of their Wall Street and corporate donors, have maliciously manufactured current economic conditions. But the reverse is actually the case; neoliberalism is a set of policies and an ideology that the ruling class and their political proxies developed in response to the underlying and enduring economic malaise of capitalism. That is, underlying economic conditions have been the driving force of neoliberalism, not politics and ideology. And neoliberalism has not solved the problems that it inherited from Keynesianism. Indeed, history has illustrated time and time again that the various rightist and leftist reformist political or policy programs formulated to resolve the problems produced by capitalism are inadequate to the task. Unfortunately, for sundry reasons, what has happened in the ideological ambit of left politics amounts to a divorce, a divorce of the “political” from the “economy” in the field of political economy. Rather than the so-called “vulgar Marxist” economic determinism of yore, what we have today has been aptly termed political determinism. Political determinism is the belief that the economy is driven by politics and ideology, rather than the other way around. As long as political determinism prevails on the left, the left’s vision will be myopic and its recommendations will be utterly flawed and useless. Isn’t it about time to tell the working class the truth? *Michael Rectenwald is a professor in Global Liberal Studies at New York University. He is the author ofNineteenth-Century British Secularism: Science, Religion and Literature (Palgrave Macmillan, 2016), primary editor of Global Secularisms in a Post-Secular Age (De Gruyter, 2015), and primary author ofAcademic Writing, Real World Topics (Broadview Press, 2015). His essays have appeared in numerous periodicals and anthologies, including the British Journal for the History of Science, Endevour, and George Eliot in Context (Cambridge University Press, 2013).